The recent deadly attacks in Paris by terrorists against the satirical magazine Charlie Hebdo have much of the world on edge. On this Martin Luther King Jr. Day, I can’t help but wonder what the Rev. Dr. King would have to say about it all. Though we have made strides in fulfilling his “dream,” we have a very long way to go. When I think of Dr. King, I think of his faith, hope, perseverance, love, wisdom, compassion, grace, and peace–and his work for justice and freedom for all. I don’t believe we can move forward by staying silent, and as a former English teacher, you can bet your sweet bippy that I am not a fan of book banning. Censorship does not make “bad” go away–it just makes it find other ways to come out. And who exactly has the final word on what “bad” is anyway? To this day, books like To Kill a Mockingbird are banned from many schools. I absolutely loved teaching Mockingbird in major part because of the fact that it offered opportunities for students to discuss some very important issues–discussions that often led to understanding the world and each other a little better. That’s what brings the light. So on this day, I want to share a post I wrote around a year ago. (It was back when I posted on “Frabjous Friday,” which I no longer do because of time constraints.) Though my story doesn’t directly deal with civil rights, I believe Dr. King would appreciate it because those students felt what it was like to have a voice. And as he said, our lives begin to end the day we become silent about things that matter. Originally posted January 3, 2014. The idea behind my Frabjous Friday posts is to share something joyful–or at least something that will make you smile. Today’s post was a very joyful moment in my life, and I’d like to share it with you. It happened 17 years ago almost to the day. It’s a little longer than my typical Friday post, but I hope you’ll find it worth your time. 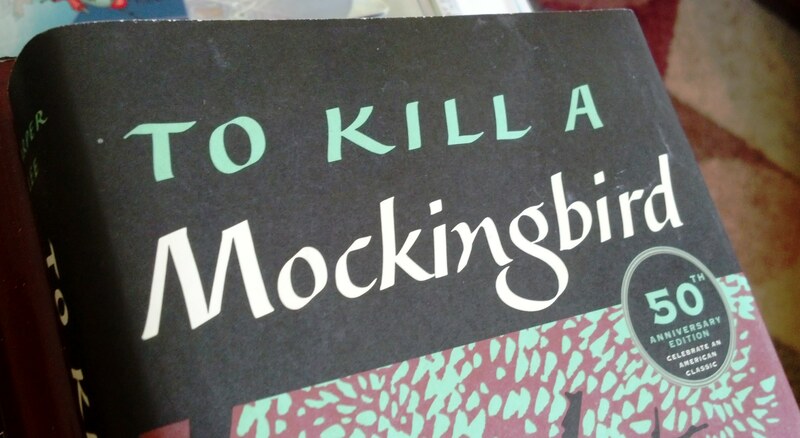 Back when I taught high school English, my freshman class read To Kill a Mockingbird as one of our core novels. I loved that book as a student, and I treasured it as a teacher. So many layers to explore and think about all delivered in a wonderfully descriptive and even suspenseful way. There was no greater joy for me as a teacher than to see a student come alive within the pages of a book, and Ms. Lee’s one and only published novel kindled that time and again. One of the activities that we did after reading it was to send notes to Harper Lee. The first time I did this and told the kids we were really going to send the letters, they were stunned. Really? In junior high they did the activity frequently, and it was just for “pretend,” as they called it. I told them why wouldn’t we send them when she is still around to receive them? This made them take their own words a little more seriously. A real author–one whose work many had grown to care for–would be reading it, after all! I showed them all how I put their letters into a big manila envelope and addressed it to “Harper Lee, Monroeville, Alabama” with the proper zip code. Since Harper Lee was a recluse, this was the best I could do. I figured the town knew her whereabouts. The first year’s letter writing experience had been positive enough that I did it again the next year, with much the same response from the students. As a teacher, it was satisfying to know that the kids realized their words were being delivered. It mattered. I just didn’t know it mattered to Ms. Lee, too. One day, a few weeks after the second batch of letters had been sent, I went to my teacher’s mailbox. Inside was an envelope the size of a thank you card, and I could see that the return address had “Monroeville, AL” written on it. My hands started to tremble. Was it possible that one of the nation’s great authors had written back to us? Why, yes. Yes she did. I couldn’t believe it. How kind she was to let my students (and me!) know that she had read every letter with “great care and enjoyment.” My students were giddy with excitement–and it’s not often you see 14-year-olds giddy about anything. It was a tremendous validation for them–and for me as an educator. Words matter. Thought matters. Kindness matters. I hope my former students think back on that experience with joy. I know I do. Ms. Lee’s letter still graces my office and makes me smile every time I see it. 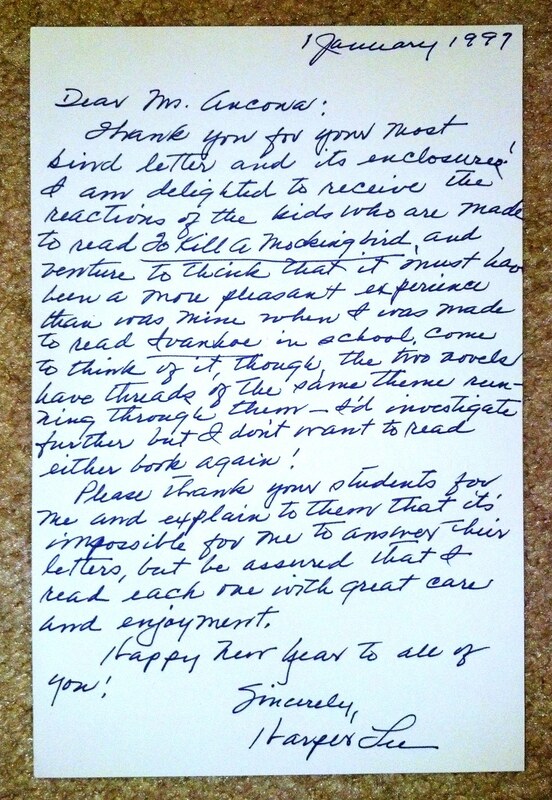 17 years ago Harper Lee wished me and my students a Happy New Year. How cool is that? This week, I am stepping out of reality. At least my reality. Of course, all will still be real, but not my normal real, and that is something I deeply need.